Some people believe that making your own sausage is a complicated and daunting undertaking. But making your own sausage is easier than you might think. Here is a step-by-step guide that explains how you can make delicious homemade sausage in your own kitchen. Use a variety of sharp knives, from a boning knife for removing the fat from the skin, to a butcher knife for chopping the pork into usable chunks for feeding into a meat grinder. Though you may be tempted to remove all of the fat, a great deal of sausage flavor comes from the fat, so leave a good portion of fat on the meat. Using a food scale, weigh out the appropriate batch weights according to the sausage recipe you are using. With a meat grinder, grind each batch using the appropriate grinding plate for the type of sausage you are making. The grinding plates with smaller holes make finer ground meat, while the grinding plates with larger holes make a more coarse grind. If you will be using natural casings (hog casings, sheep casings, beef casings), or collagen casings, soak the casings in a bowl of cold water. After about 30 minutes, change the water and soak for another 30 minutes. Hold one end of the casing up to a tap and add some cold water. Now pinch off that end and slosh the water around inside the casing, working your way to the other end. Empty the water completely from the casing and collect in a bowl for use on stuffer. Measure out the seasonings from the sausage recipe you are following for your batch size. 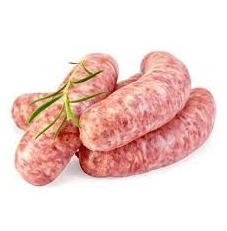 Here at Meat Processing Products, we have a variety of sausage recipes for you to try on our Sausage Recipes Page. We also have a wide variety of Sausage Seasoning Mixes to choose from. Thoroughly mix the seasonings with the ground meat. It�s easiest to use a meat mixer, but you can also wear gloves and do the mixing by hand in a large mixing bowl. Before stuffing the sausage into casings, cook a little of the seasoned sausage in a small frying pan to test the flavor. Adjust the seasoning if necessary and repeat until seasoned to taste. If not stuffing, either make into patties by hand or with a patty maker or store in a meat storage bag to use as loose meat in recipes such as lasagna or anything requiring ground beef. Ground sausage meat certainly adds more flavour to a recipe instead of plain ground beef! Now you are ready to stuff the seasoned meat into the casings using a sausage stuffer. With a paper towel soaked with a little vegetable oil, coat the stuffer horn with oil. This makes putting on and taking off the casings easier. Close off the end of the casing with a metal hog ring, cotton butcher twine, or just tie a knot into the casing itself. Using a sausage pricker, prick the end of the casing so that the trapped air can escape. Stuffing the sausage into the casings is much easier with two people. One person can control the sausage stuffer, passing the meat through the stuffer and into the casing. The second person can control the casing by moving the sausage along and monitoring air pockets that may form in the sausage. If any air pockets show up, just use the sausage pricker to release the air. When you reach a desired link length, twirl the link a couple of times to form a link. Continue stuffing until another link length has come out. Now turn this link a couple of turns the opposite direction as the first. This will keep the links from unraveling. If you go the same direction, you�ll un-do the first sausage link. Alernatively, instead of making links right out of the sausage stuffer, the whole casing could be filled first and a closed off at both ends to make a long coil. It could be kept this way as a single coil, or the links could be made at this time. Just remember to always twirl the next link the opposite way. The links can also be tied off individually with hog rings, or cotton butcher string. Place each coil on a large parchment paper lined tray. The sausage is now ready for smoking in a meat smoker, drying in a dehydrator, cooking, or freezing. If you will be freezing the sausage, we recommend storing the sausage in a vacuum sealed bag using a vacuum sealer.